Standing at just under 60 centimeters in height, two 4th century BC marble vessels – a funerary lekythos and a loutrophoros – that the Greek state is in negotiations to repatriate from Switzerland have traveled across four countries, changing hands dozens of times between mediators, merchants, art collectors and even police authorities. They were photographed, sold, confiscated and sold again, leaving a trail – however faint – of shady dealings. The repatriation drive started in October 2017 when a student of forensic archaeologist Christos Tsirogiannis at Cambridge University – who is known for his work hunting down antiquities smuggling rackets – was attending the Galleries at Frieze Masters exhibition in London and spotted the two Attic vessels at the stall of Swiss art dealer Jean-David Cahn, a specialist in Greek and Roman antiquities. The student photographed the pieces and sent the images to Tsirogiannis, knowing he would be interested. Tsirogiannis started comparing the photographs with images in an album of antiquities suspected of having been stolen while also studying collection histories in order to ascertain their provenance. The evidence he uncovered pointed to some shady dealings in their past. Tsirogiannis told Kathimerini recently that he found Polaroid shots of both vessels from the seized archives of notorious Italian antiquities smuggler Gianfranco Becchina. The lekythos depicts the deceased and his family, and bears an inscription with their names, details that had been noted by the smugglers in red marker on the Polaroid to underscore the piece’s authenticity. As soon as he identified the vessels, the Greek investigator informed Interpol of his discovery. The objects were seized from the Swiss art collector, paving the way for the battle for their return to Greece. The case was assigned to Ilias Bissias, a lawyer based in Athens and Zurich who has successfully represented the Greek state in similar claims. He declined to comment as the case is ongoing, but did note that it is a crucial juncture. The preliminary investigation by the Greek judicial authorities into the two vessels’ provenance is also under way. What is already known, however, is that two people who have fallen foul of Greek justice in the past are involved in the case of the two vessels. Becchina was convicted in Greece in 2017 and 2018 to a respective 11 and seven years in prison for accepting four Early Christian murals that were stolen from a church on the island of Euboea (Evia) and for embezzlement. 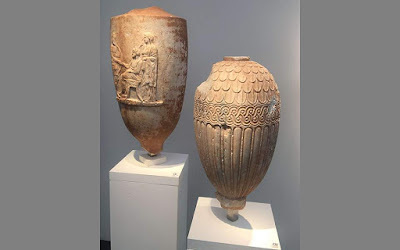 Cahn, meanwhile, has twice reached a settlement with the Greek state for the return of ancient objects that were illegally smuggled out of the country – in both these repatriations the Greek state was represented by Bissias. The objects in question are a 1st century AD headless statue of Apollo Lyceus that was stolen along with another nine artifacts from Gortyn on Crete. It is a replica of an original statue that has been attributed to Praxiteles or his school and had been tracked to Switzerland 16 years after being stolen from Greece. Cahn had sold it to a private buyer but had not yet delivered it when he was approached by authorities and negotiated a deal to return it in 2007. Then, in 2008, he returned a 4th century BC marble lekythos that he had put up for auction at an international art fair in Maastricht before it was identified as the object of antiquities smuggling. In the current case of the two marble vessels, Cahn is acting as the mediator representing the Swiss canton of Basel. That story dates back to 2002 and a police raid on Becchina’s gallery in Basel, where authorities seized and photographed more than 5,800 objects of suspect provenance, most of which were repatriated in the years that followed to Italy. In 2006, the Culture Ministry in Athens received five CDs with photographs of objects that were suspected of having come from Greece from the Becchina archive, which to this day serves as an important means of identifying items that may have been trafficked. In 2011, the Italian authorities returned 19 objects that had been sent for repatriation there back to the Swiss. These included the two Greek marble vessels, which were handed to Cahn by Swiss authorities so he could sell them in order to settle a part of Becchina’s debts to the state. What is odd about this particular case is that the two vessels were passed between the Italian and Swiss authorities, without the Greek authorities being informed earlier, even though Becchina was involved. For his part, Cahn issued a statement on his website saying he had received assurances that the two objects had been acquired legally. He claims the Swiss authorities had been given the green light to sell the vessels by a legal expert at the University of Geneva, though he did not provide a name. Cahn also claimed he checked that the two vessels did not appear on the Art Loss Register database of stolen art and found no mention of them. 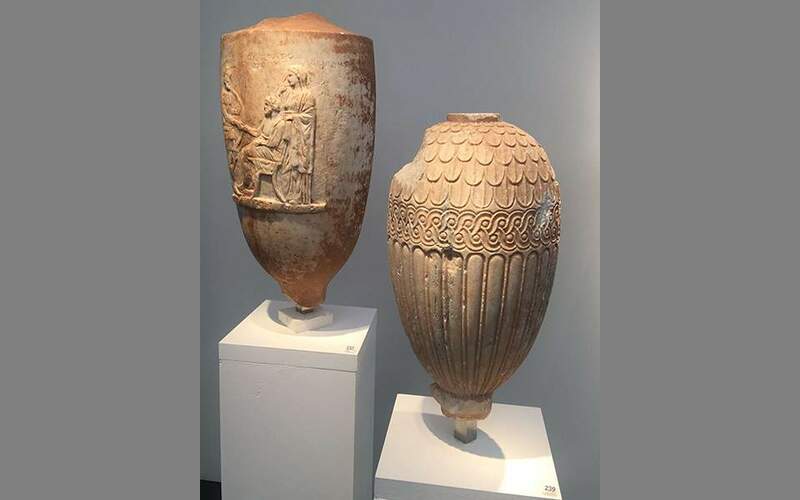 Apart from whatever legal questions may arise from the matter, the case also has a diplomatic aspect, as Greece and Switzerland signed an agreement for the repatriation of cultural goods in 2007.